It has been bitterly cold and snowy in Minnesota. 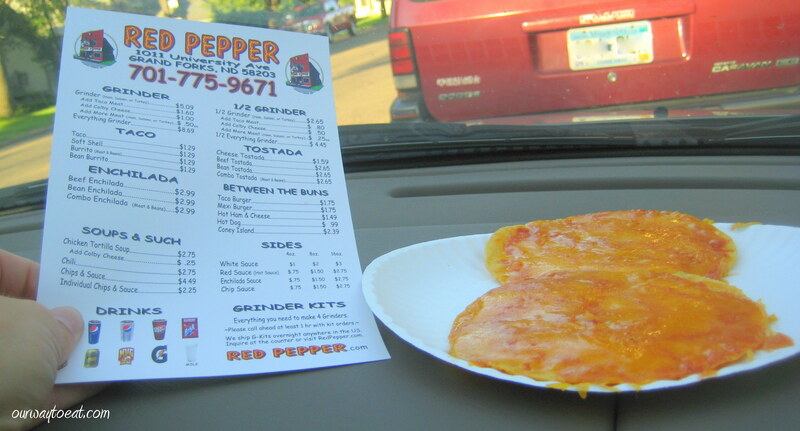 I am at once craving variety and comforting, old-school Midwestern staples. These individual Nacho “Pot Pies” are comforting, easy to make for meat eaters and vegetarians, and are also a tasty departure from everyday chicken pot pies. I kept the calorie count under control using fat-free Greek yogurt in the creamy pot pie filling instead of cream or half n’ half, and topped them with a small serving of multigrain chips instead of a buttery crust. We thought the texture and flavor were perfect. 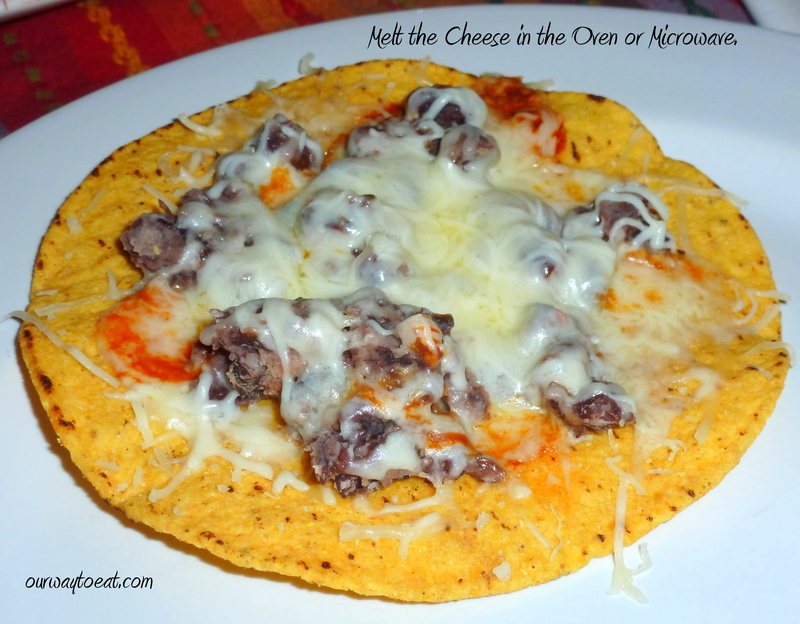 When served, each person can add nacho toppings as judiciously as they desire. These mini-casseroles aren’t as “fancy” as Day After Thanksgiving Individual Pot Pies with or without turkey, but they are a guaranteed happy meal for a dreary winter week night or a main course at a Superbowl Party. 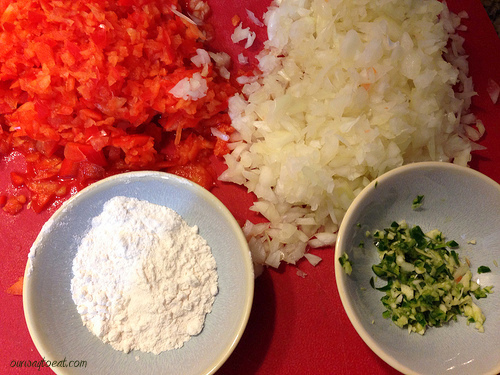 1 Jalapeno Pepper, seeds removed and minced—add an extra pepper for more heat. 1.5 Tablespoons of Taco Seasoning I use Home-Made Taco Seasoning following the Girl Who Ate Everything’s recipe. Method: Preheat oven to 375 degrees. 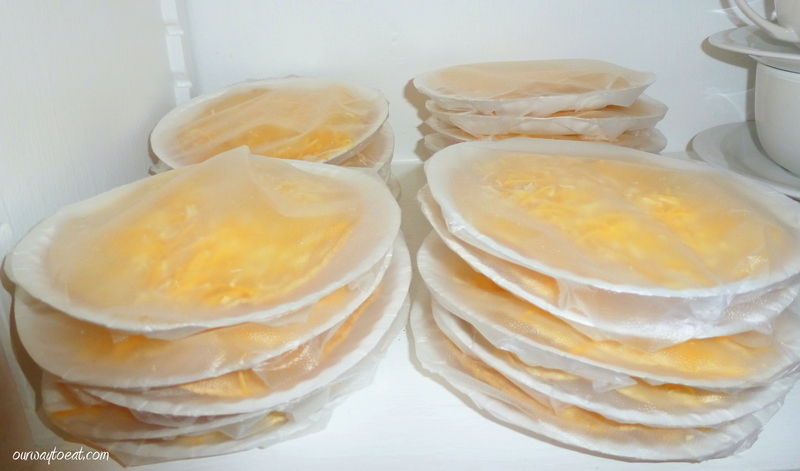 Coat individual 5-inch baking dishes, or a small casserole dish or glass pie plate with cooking spray or oil. Sauté onions in olive oil until translucent, add chopped red pepper and cook 2 minutes. Add garlic and jalapeno, cook one minute until fragrant. 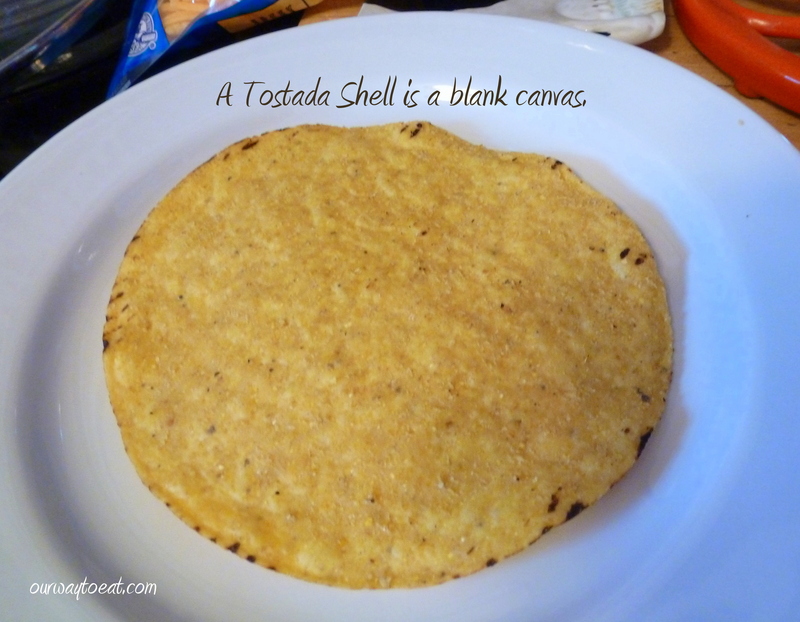 Sprinkle taco seasoning and flour, blend together and cook 1 minute. Add stock and bring to a boil, then simmer 2-3 minutes until slightly thickened. Stir in Greek yogurt, most of the black beans and corn. 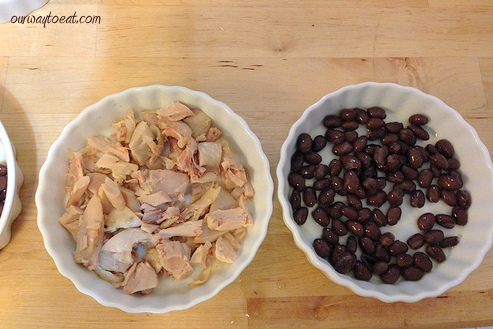 Add chicken, or a few extra spoonfuls of baked beans into each dish. Divide filling between individual baking dishes. 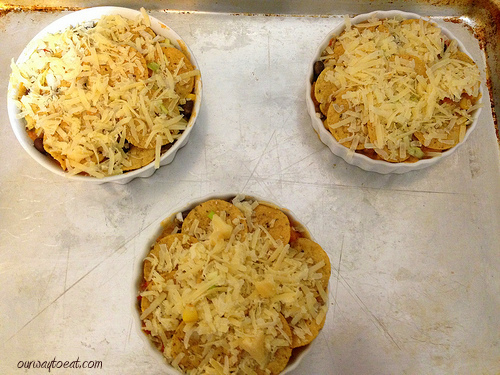 Top with tortilla chips, scallions and shredded cheese. Bake at 375 degrees, 18-22 minutes until golden. 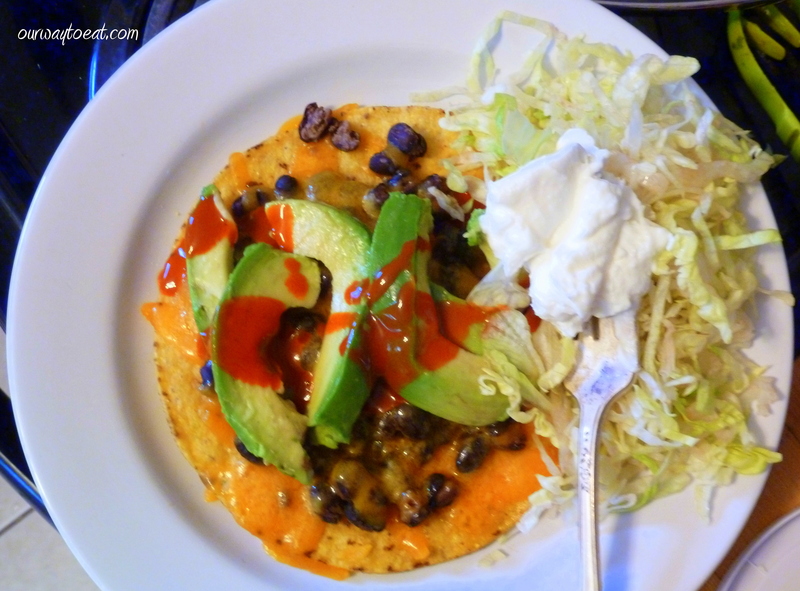 Serve with traditional nacho/taco accompaniments: shredded lettuce, diced tomatoes, sliced olives, sour cream, sliced avocado, lime wedges and salsa. 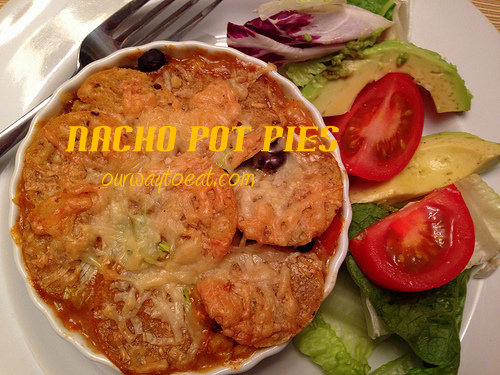 These are Nacho Grandma’s Pot Pies. I have a small group of girlfriends from school who all live around the Twin Cities with their wonderful husbands and significant others. We all have busy lives, so we don’t see as much of each other as we could before we all grew up and joined the workforce, but we manage to keep in touch by making sure every big event in each of our lives is celebrated. There are 5 of us in total which means we all get a chance to host small group celebrations every time someone gets engaged, married or has a baby, or in the lulls between those milestones, someone hosts a brunch or a game night. 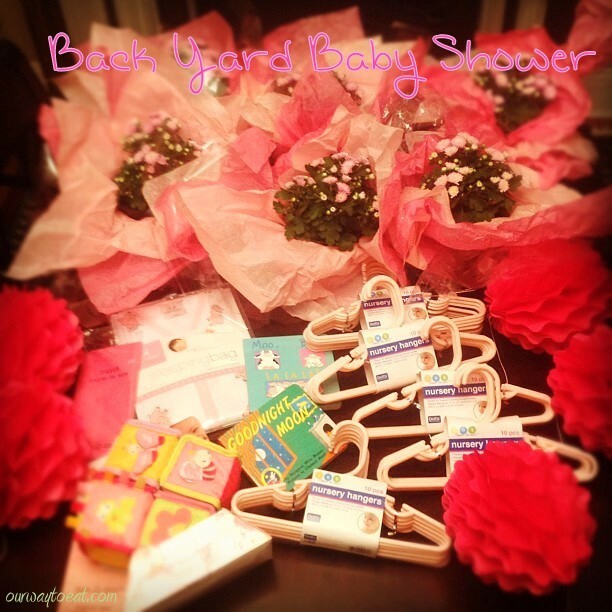 In early September, I hosted a baby shower for Betsy, who was expecting a baby girl. 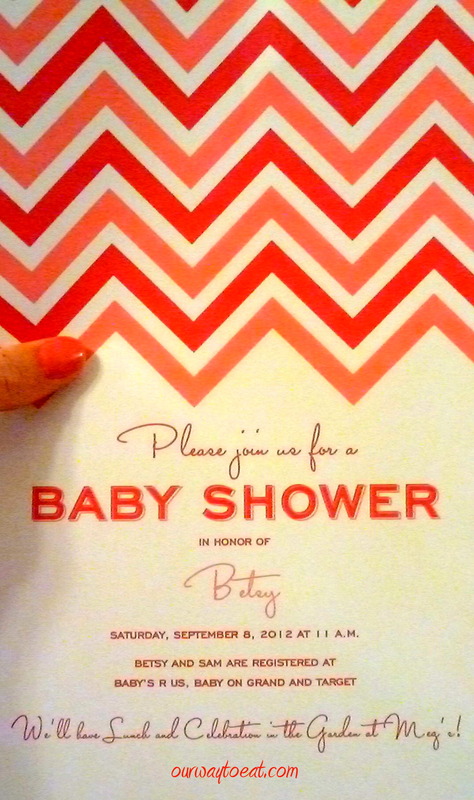 This is the chevron shower invite that I created at ontobaby.com, a great website that I happened upon that allows you to customize colors and content and create many neat things for free, and then print them, or send them out via email as a PDF. Since the shower, teeny little Vivian Kiyoko arrived, and she is beautiful and I am so thrilled for Betsy and her husband, Sam that they are parents of this perfect little person. Like most easygoing and enjoyable parties, this one started with advanced preparation. 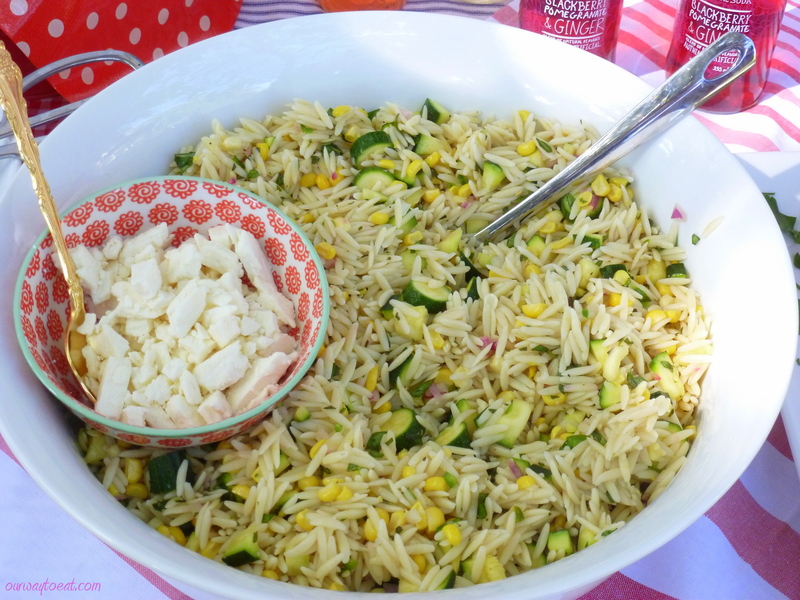 I made a full recipe of Martha Stewart’s Corn and Zucchini Orzo Salad. The salad was lemony with juice of 3 lemons and zest, kicky from the jalapenos from our garden, tasty and light, but the recipe, which reports to yield 6 servings yields something closer to 16 servings. 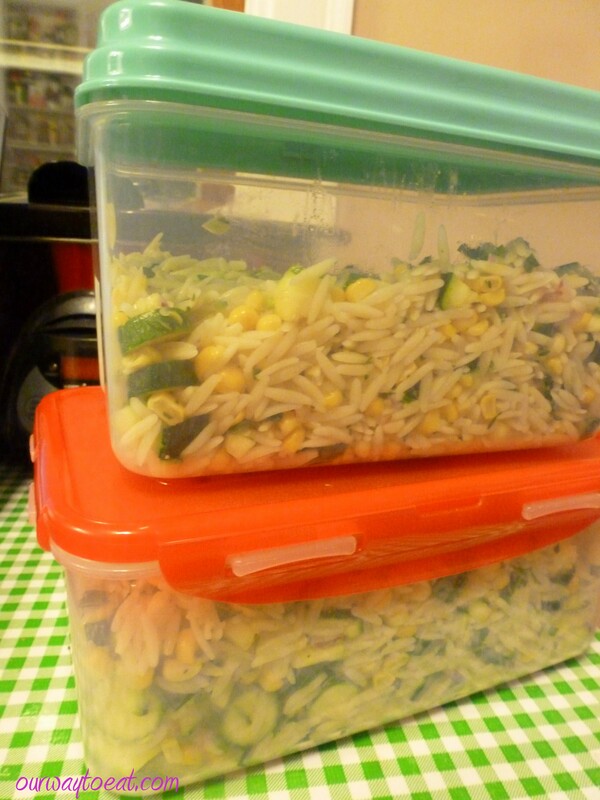 I guess the pound of orzo pasta, 6 medium zucchini and 6 ears of corn should have been a tip-off. Everyone loved the salad and it made for some good leftovers the next week for lunch. I served the crumbled feta in a separate bowl so each person could add their own. Somewhere along the line while preparing for the shower I read an article about all the things pregnant and nursing moms aren’t supposed to eat, so anything that could vaguely be construed to be unpasteurized or uncured was served separately, even though most of my groceries probably satisfied both of these pregnant-person dietary requirements. I’m a vegetarian in a mostly meat-eating world, so I am (over)sensitive to this sort of thing. 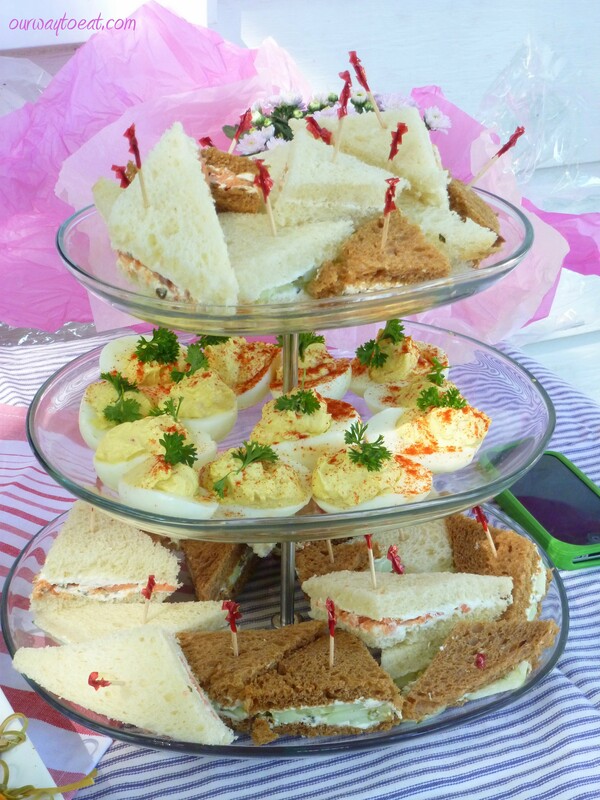 I am so glad that Tea Sandwiches and Deviled Eggs are back in vogue. I like both of these baby shower classic snacks, so I made both. Tea Sandwiches are perfect baby shower bites–they are small, cute and girly. 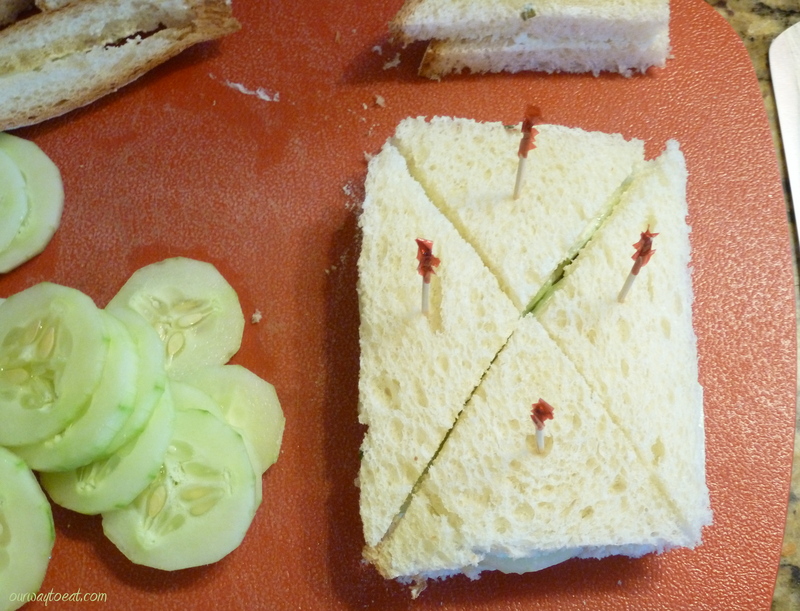 I made cucumber tea sandwiches with cream cheese and chives, and smoked salmon tea sandwiches with the same spread. Both the sandwiches and classic deviled eggs were yummy. Decorations are one of the things that make a gathering into a party, so even though this is a small shower with a group of girls who gather with some regularity and don’t rely on pretense, I had to decorate. Betsy was expecting a girl, I took that as license to go pink. 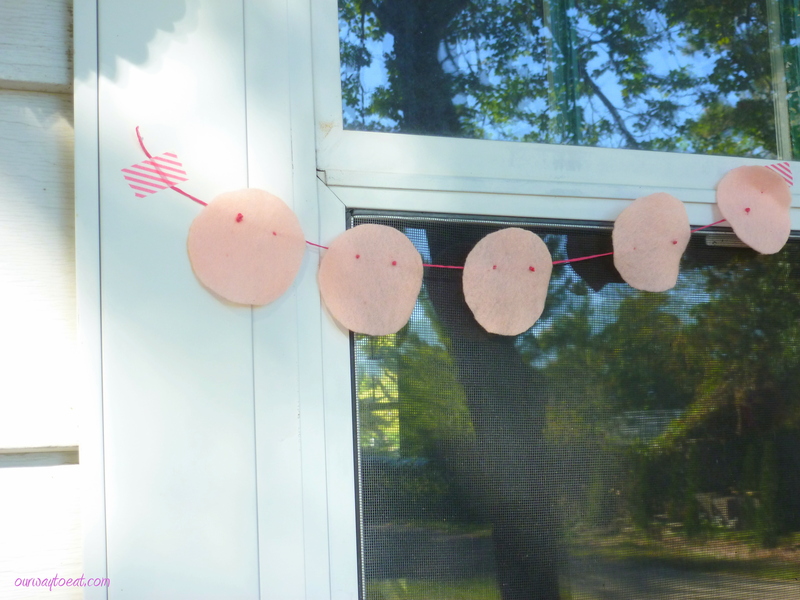 I cut dots out of pink felt and strung them into a garland on embroidery floss. Each felt dot is secured to the embroidery thread with two hand-stitched french knots. [Try saying that five times fast.] I stuck these around the patio with pink striped washi tape. 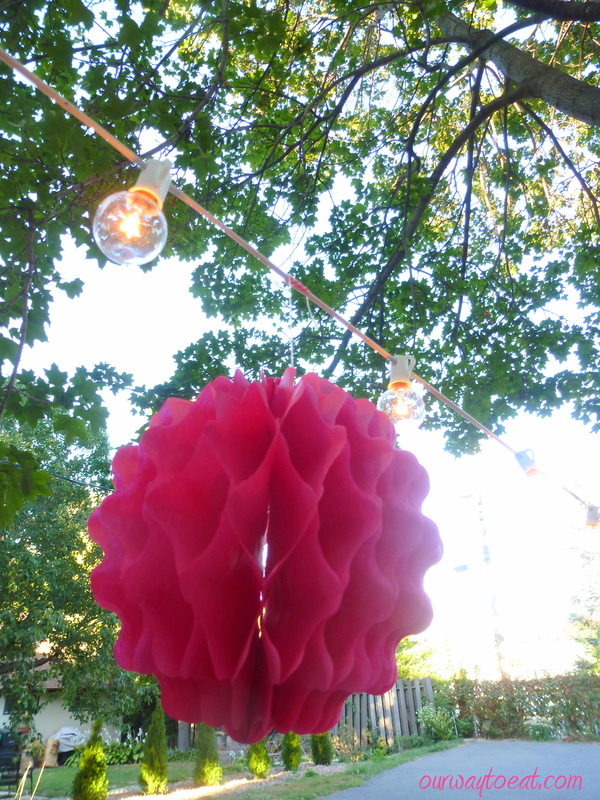 I also hung pink tissue paper balls from the house and our patio lights with washi tape. I bought little pots of pink mums; hearty ones, like the moms and moms-to-be at the shower. I wrapped the pots in poufy pink tissue paper, shiny clear wrapping paper and secured the paper to each pot with a wide pink ribbon, tied in a bow. 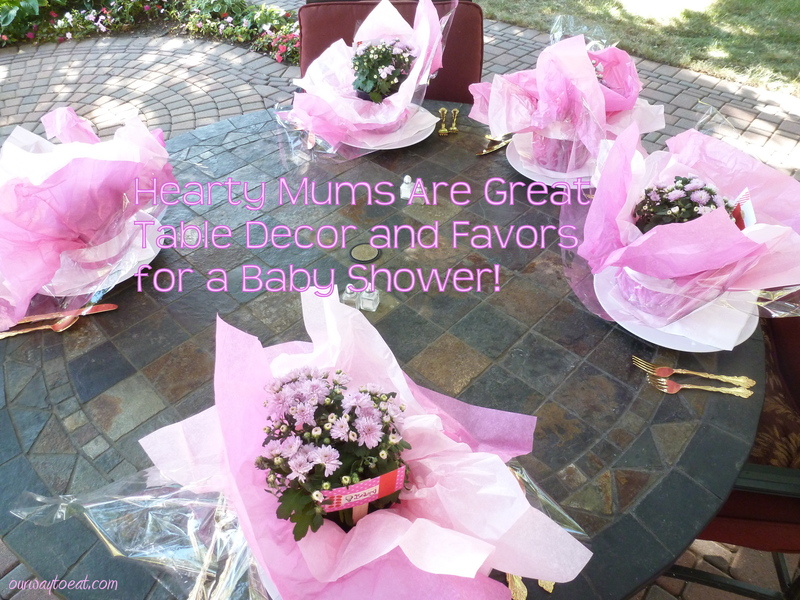 The hearty mums decorated the table and served as a little favor for each person to take home. 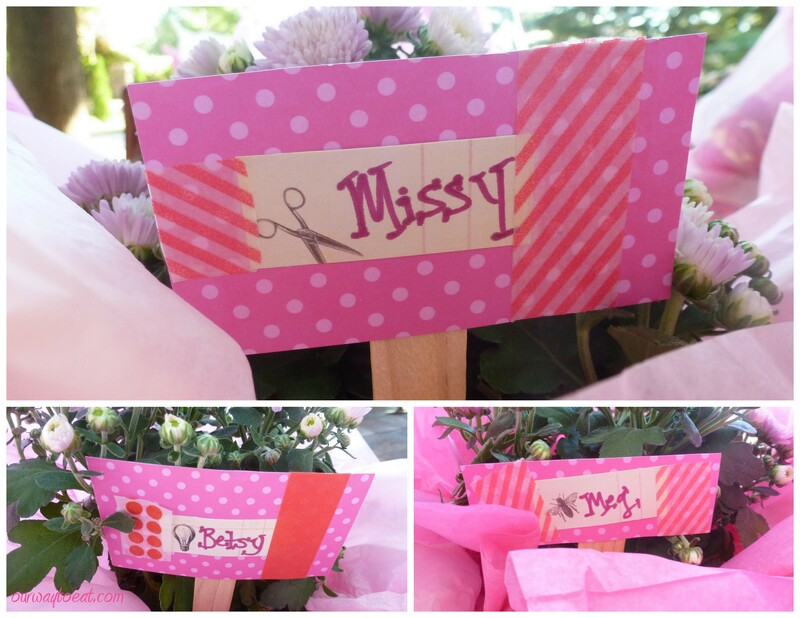 I marked every person’s place at the table with a plant stake topped with a pink polka-dot name card that I made with a strip of card stock, further embellished with washi tape that I stuck into the pot of mums at each place. 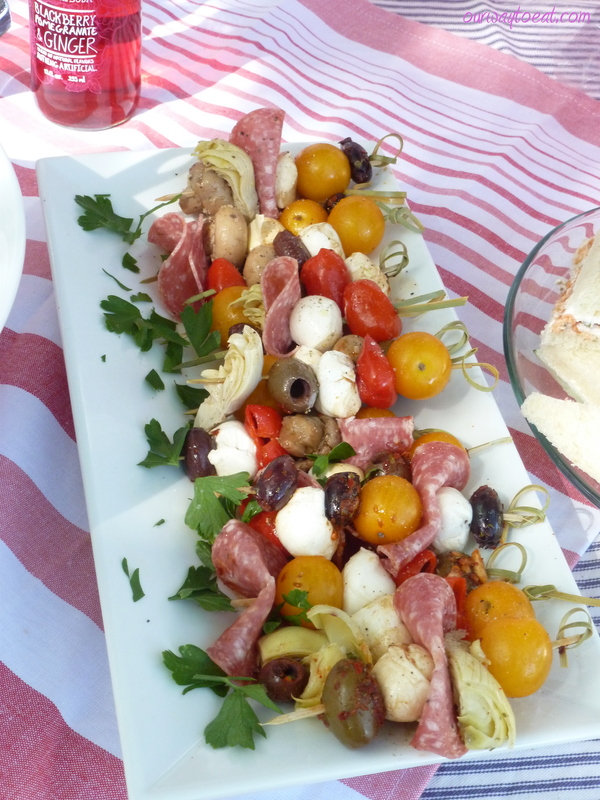 To round out our lunch I served antipasto skewers which consist of golden cherry tomatoes, marinated artichoke heart quarters, salami, fresh mozzarella, marinated mushrooms, peppers and seasoned olives from the grocery store olive bar threaded on to short bamboo skewers, dressed lightly with balsamic vinaigrette and garnished with fresh flat-leaf parsley from our garden. 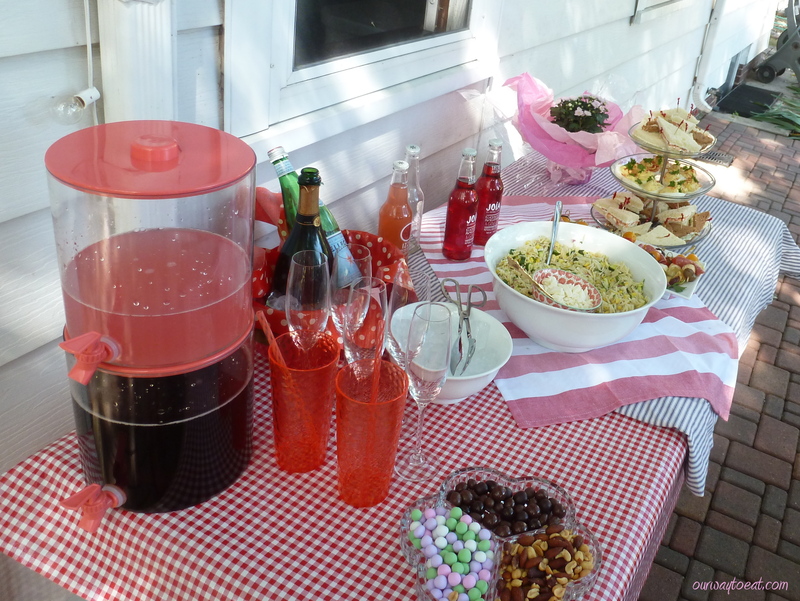 I set up a buffet table on the patio so that we could help ourselves to food and drink while we relaxed and talked. 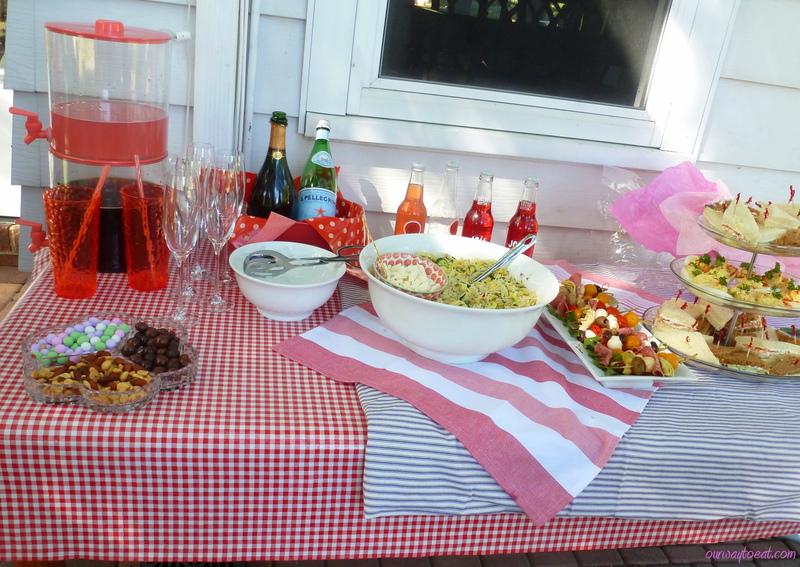 I set out pink tumblers and reusable striped straws as well as champagne glasses out so everyone could pour their own pink lemon-aid Arnie Palmers from drink dispensers and San Pelligrino sparkling water from the bottle which was sitting on ice. I also set out bottles of fruity Joaia and Izzy’s soda, and of course, we popped a bottle of champagne. I served mixed nuts, mints and bridge mix in a cut glass candy dish, another nod to classic baby shower fare that I am happy to revive. Desert was simple and totally a highlight. I whipped cream and stirred in sugar and vanilla, and sliced strawberries and blueberries which macerated in sugar in the fridge. 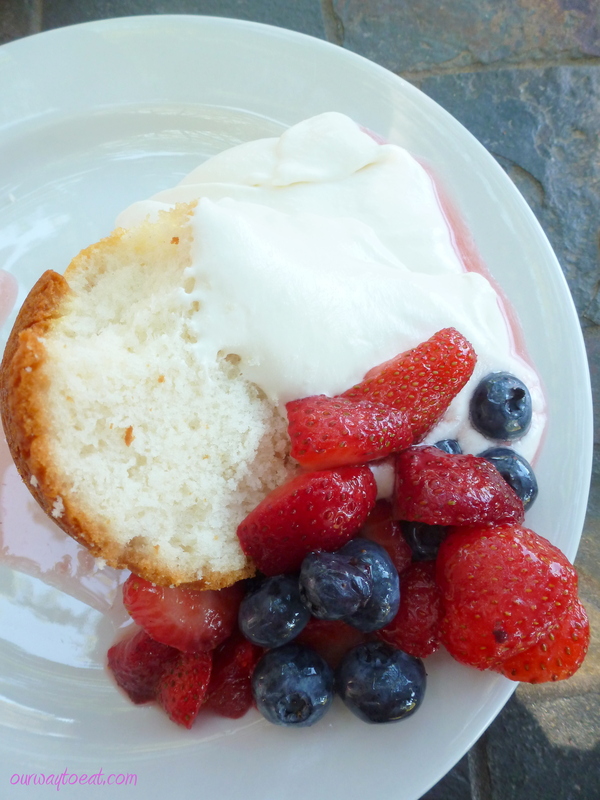 The whipped cream and fruit were a delicious topping to a white cake made in a bundt pan, served with coffee. 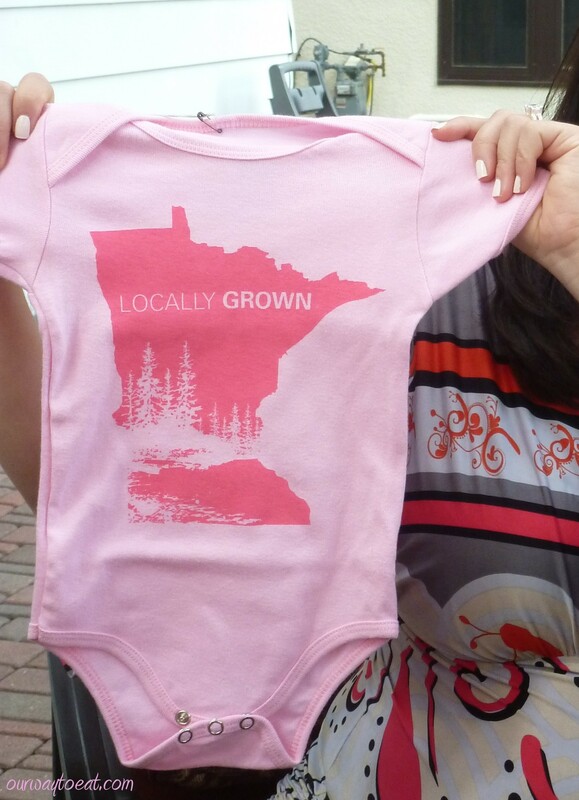 Betsy took home a nice assortment of cute baby gear, books, clothes and other essentials, and this cute Locally Grown Clothing Co Minnesota onesie. Nice pick, Alison. September was a busy month! Having to buy a new car and getting a new roof for our house and a few trips out of town took the time I’d normally devote to blogging, but I’m back and planning to share a few “catch up” posts about the fun we’ve been having, stop back! I love the heat, energy and fireworks explosion of people out enjoying life in every possible way that takes place in July; but to me, August is the heart of summer. I savor August days when the pace of life slows down, the garden booms and I can pause to soak in warmth, the natural wonders, brilliant flavors and the easy pace that life settles into at this time of year. I enjoy being able to base my seasons on what is happening outside, instead of on the school year or the sport’s calendar. It helps me keep the summer feeling alive to the last second when the fall chill genuinely takes hold. I understand that for many people, the first sign of a cooler evening, a fallen leaf or the school year looming close marks a change. Even so, it is too early to shift to autumn-cooking mode while the garden and farmer’s market is overflowing with beautiful summer vegetables and fruits. If you have a potluck, picnic or BBQ left on the agenda, trotting out the classic potato salad is probably starting to seem a little dull and repetitive. 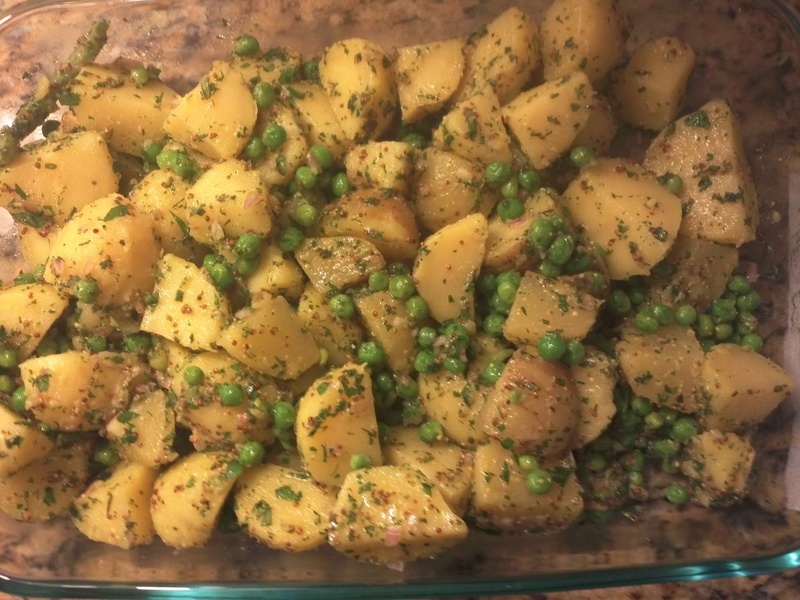 This is when it is time to turn the traditional potato salad on its heel–add some veggies to the ingredient list, subtract the typical mayo-based dressing. 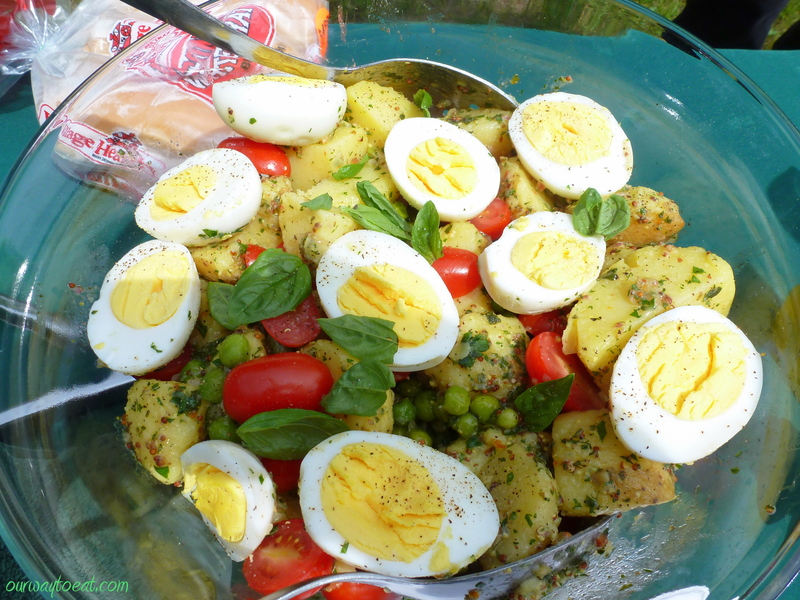 With a few tweaks, you have a bright, fresh twist on a classic potato salad that capitalizes on August abundance and tastes and looks so different, you will forget the creamy classic potato salad recipe you wore out in June and July. 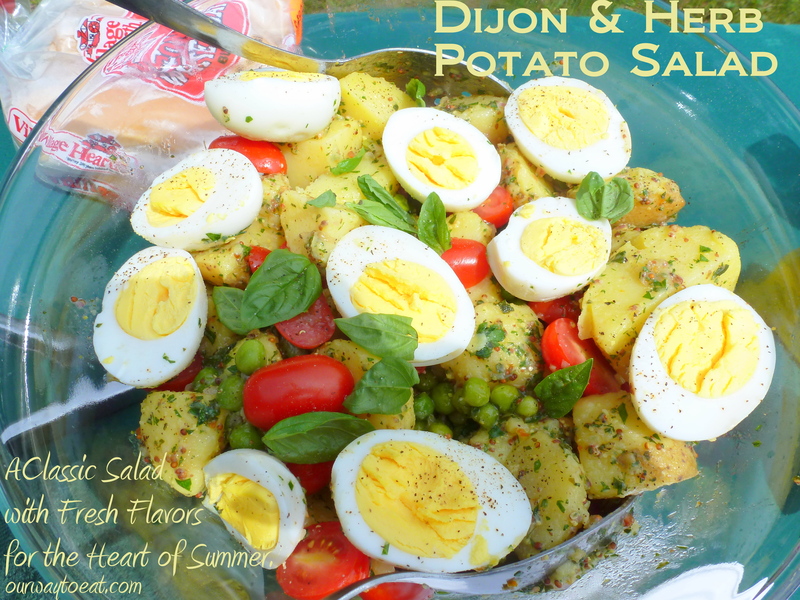 Dijon and Herb Potato Salad– Yield: 6 generous servings, 20 minutes hands-on, 50 minutes total time. Drop the potatoes into a large pot of boiling, lightly salted water and cook for 20 to 30 minutes, until they are just cooked through. Drain the potatoes in a colander, then place them in a large bowl with the fresh peas or string beans on top and cover with a clean towel. This allows the beans or peas to steam along with the potatoes for 10 minutes more. Note, this approach worked for me, though if you are nervous about the peas or beans being cooked, add, them to the pot of boiling potatoes for the last few minutes, or steam them separately. Cut the potatoes in half or quarters if they are large. If you used Yukon Gold potatoes, you can slip off the skins right off at this point if you like. Toss the potatoes gently with chicken stock. Allow the liquid to soak into the warm potatoes before proceeding. Combine the vinegar, mustard, olive oil with 1/2 teaspoon salt, and 1/4 teaspoon pepper in a small jar with a tight-fitting lid. Shake vigorously to make an emulsion. Add the vinaigrette to the potatoes. 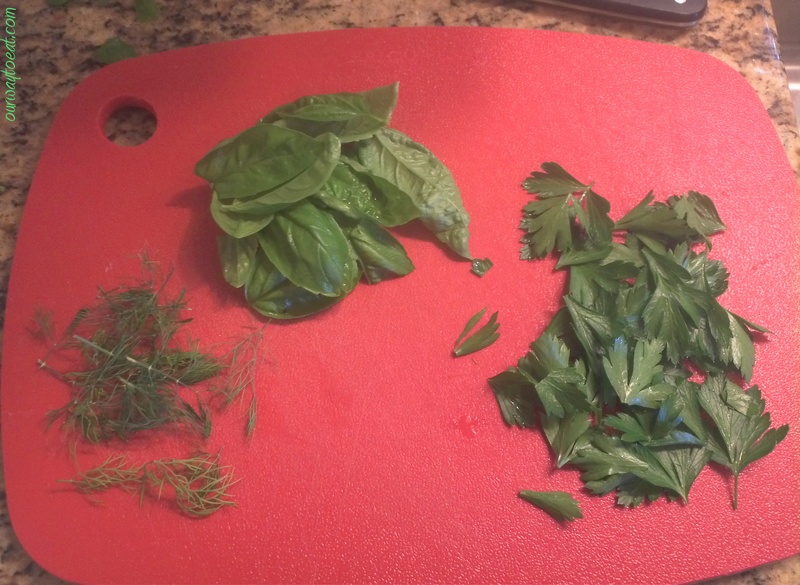 Add the shallot, dill, parsley, basil, salt and pepper and gently toss. Just before serving, toss in the halved tomatoes and top the salad with halved hard-boiled eggs, fresh cracked pepper and small basil leaves. Serve warm or at room temperature. 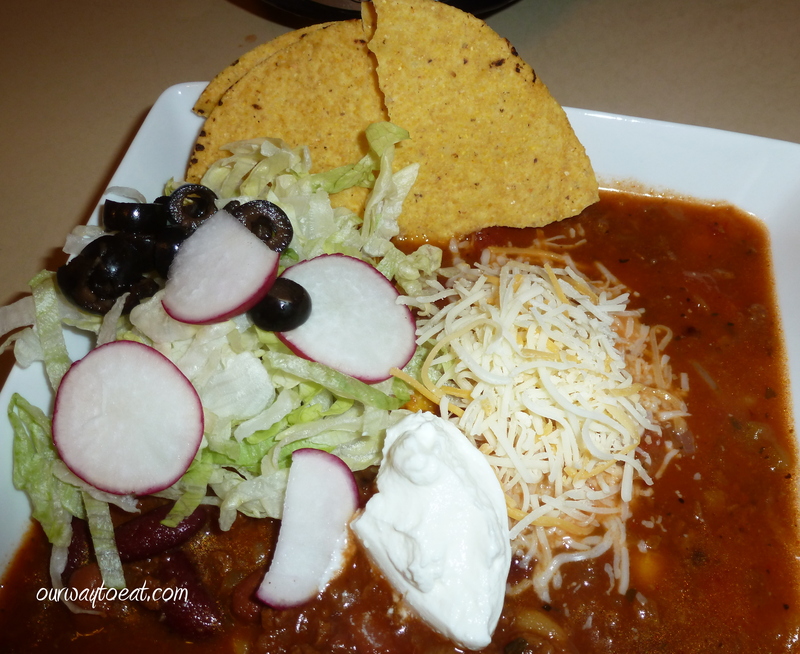 If you are ready to take a break from Chili, Chicken Wings or Pizza as your Superbowl staple next year, you might want to try Taco Soup. I made a crock this year and it was tasty, and so easy. This is a meal that you can easily adapt for omnivores as well as the vegetarians in your crowd. You can make this meal and have time to enjoy your day if you are capable of visiting the grocery store and using a can opener. The ingredients pictured below include Two 14 ounce cans of Stewed Tomatoes, Two 14 ounce cans of Diced Tomatoes, One small can of chopped green chilies, One 14 ounce can of Pinto Beans (I used Chili Beans which are seasoned Pinto Beans), One 14 ounce can of Kidney Beans and One 14 ounce can of Golden Hominy, which you can find in the grocery store near the canned beans. An envelope of low sodium Taco Seasoning or your favorite homemade mix of spicy seasonings, mixed according to preference, which should probably include, Cumin, Mexican Chili Powder, Paprika, Cayenne Pepper, Oregano, Salt and Pepper. 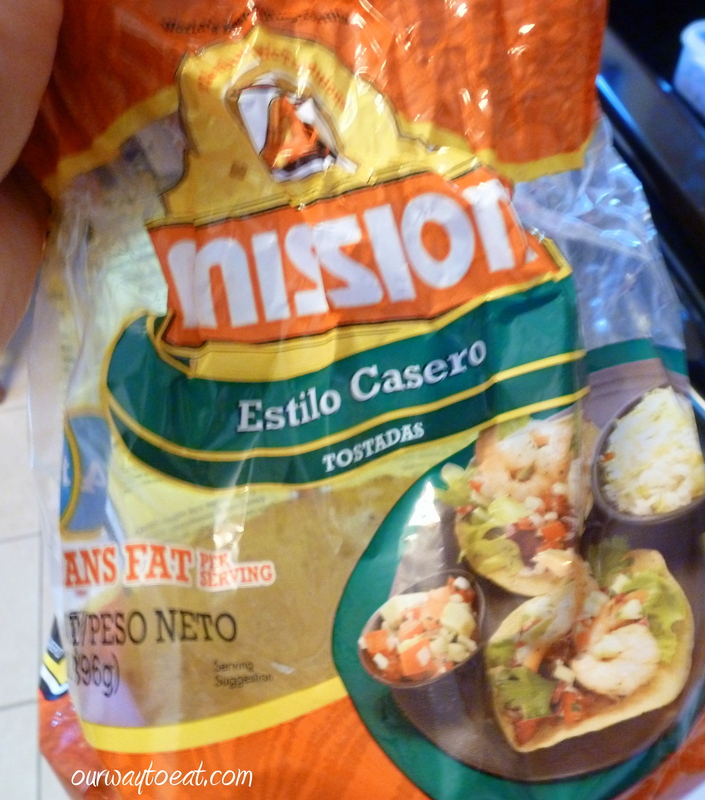 If you wish, you can add Vegetarian taco crumbles, prepared according to package directions for the vegetarian version. 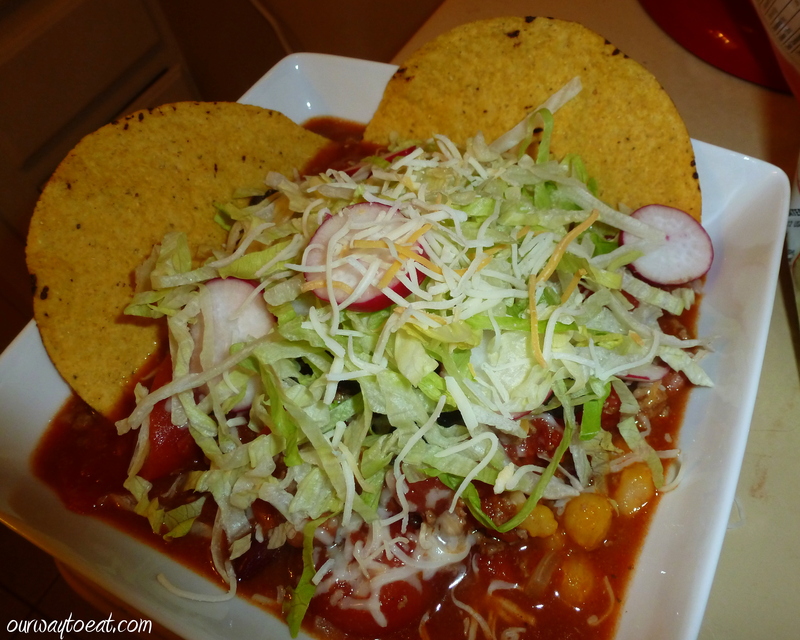 If you do opt for Vegetarian Taco crumbles, I like Taco Filling by Fantastic Foods. I put everything into the crock except for the meat, and set the heat to high because game time was only a few hours away. 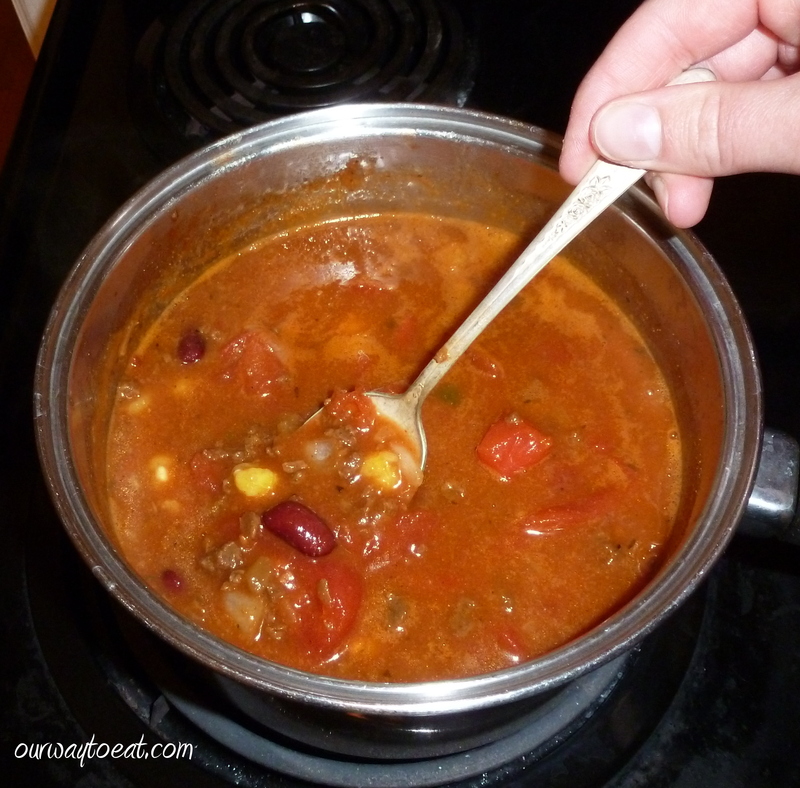 You can make this on the stove in your favorite soup pan or dutch oven just as successfully as the crock pot, but I love the “fix it and forget it” aspect of cooking in the crock pot. After the beans, hominy, seasonings and onions had a good hour and a half to get warm and combined, I ladled a vegetarian portion into a separate sauce pan and put it in the fridge. I recommend giving the ground beef version more time in the crock, and separating out the veggie version into a separate pan as needed. The beef needs time to gather up the flavors in the pot, and is less likely to get dried out than the vegetarian version. Next, I added the browned ground beef to the crock. 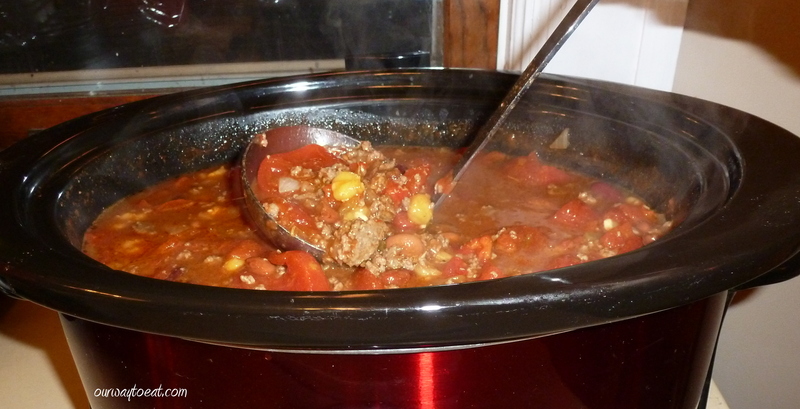 Then, all I had to do was keep the crock cooking until game time, which gave the flavors time to combine. This is where certain celebrity chefs who regularly appear on the Food Network who will remain unnamed would say that constant heat and time will allow the flavors to “marry.” I like the thought of distinct ingredients of a the soup spending time together, falling in love and then hanging out long enough to allow the distinct characteristics of each element to meld together and become a unified as a whole. But the Food Network has overworked the marriage of flavors descriptor a tad, so I’m trying to leave it on the shelf for now so that perhaps someday, that term can be revived into common use. When it was close to game time, I took the saucepan of vegetarian Taco Soup out of the fridge and reheated it on the stove over medium heat. This is where the fun part of taco soup comes in: the toppings. 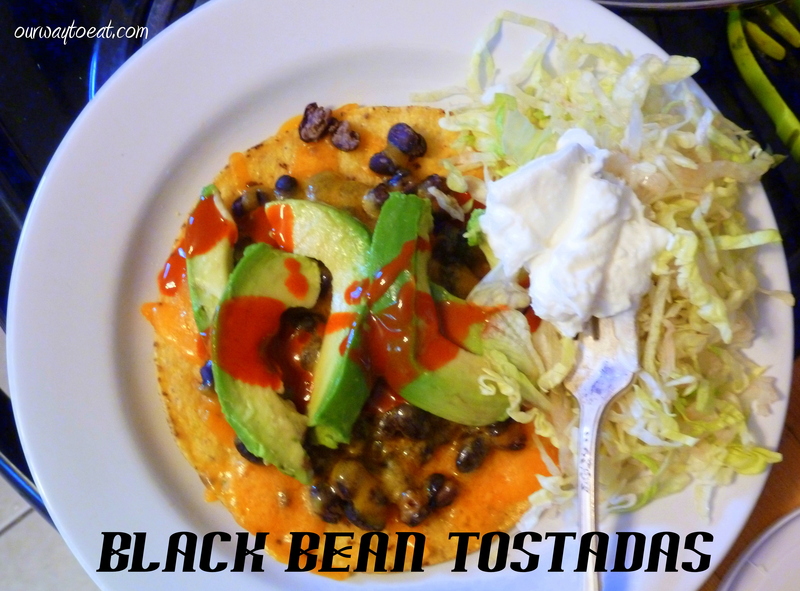 I assembled a small array of some of our favorite taco toppings to serve along with the soup. 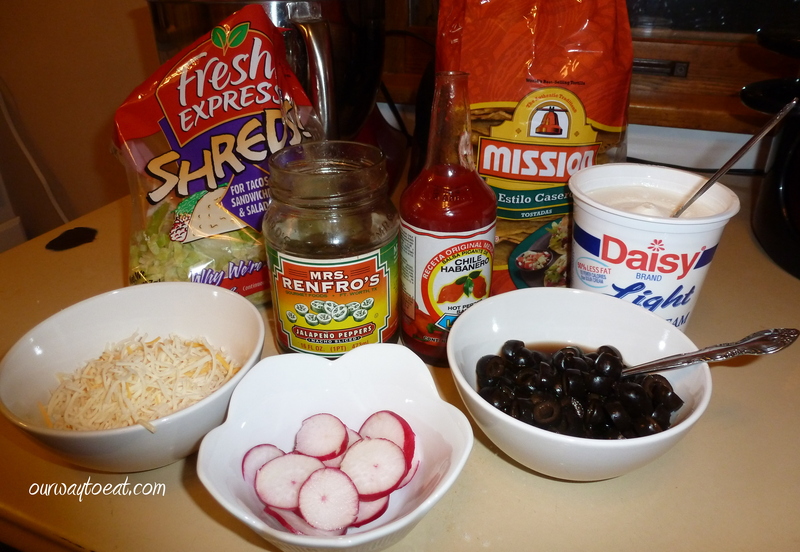 Today we had shredded lettuce, crumbled corn tostadas, sliced jalapenos, light sour cream, shredded cheese, sliced black olives and radishes. Avocado, diced cucumber, chopped green onions or diced red onion and pepitos would also be great toppings for Taco Soup. 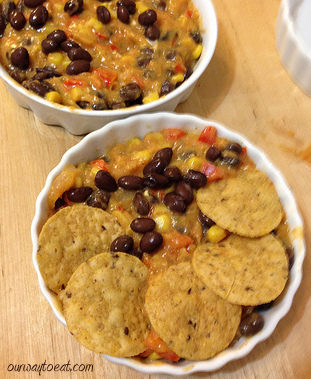 Scoop chips are great for scooping up the soup and toppings from your bowl, regular tortilla chips or crackers would also be great to serve with the soup. I served the soup in wide, shallow bowls. 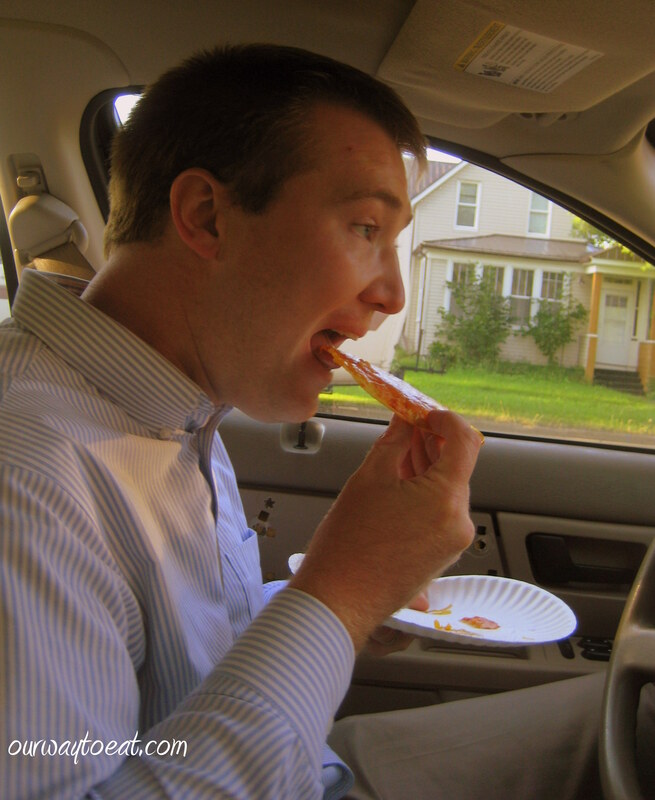 I wanted there to be enough surface space for us to add toppings. We each topped our bowl of soup the way we wanted, and then headed to the couch for kickoff. 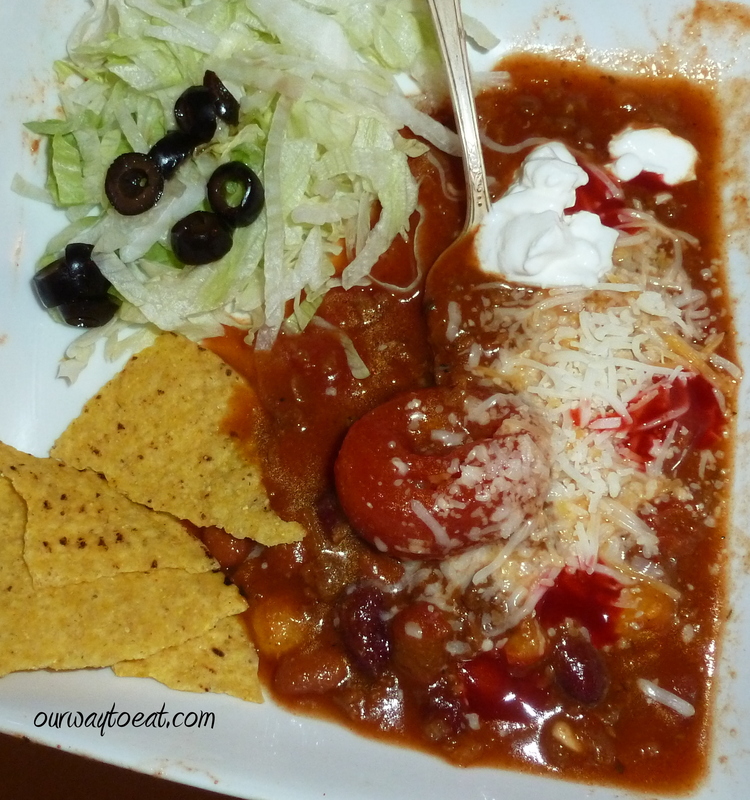 Taco soup was the main dish for us on Superbowl Sunday, but it would also work well at a potluck, served in smaller bowls or cups. Also, you sure don’t have to have an important sporting event on TV to make this for supper. 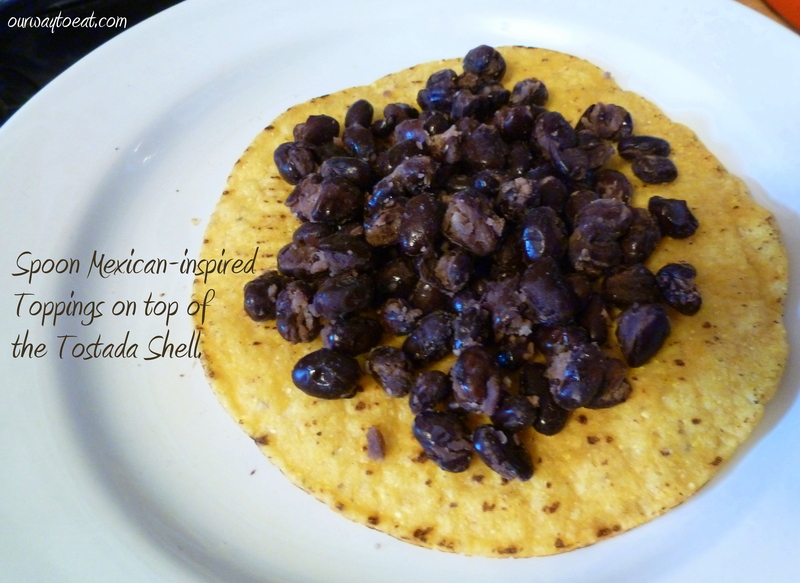 As a dish for the Superbowl, it is essential that you can eat it while seated on the couch. I will report that the shallow bowls were a good call because they did, in fact allow us to top the soup generously without making a mess, and the soup is thick enough to work just fine even with an ottoman as a dinner table. 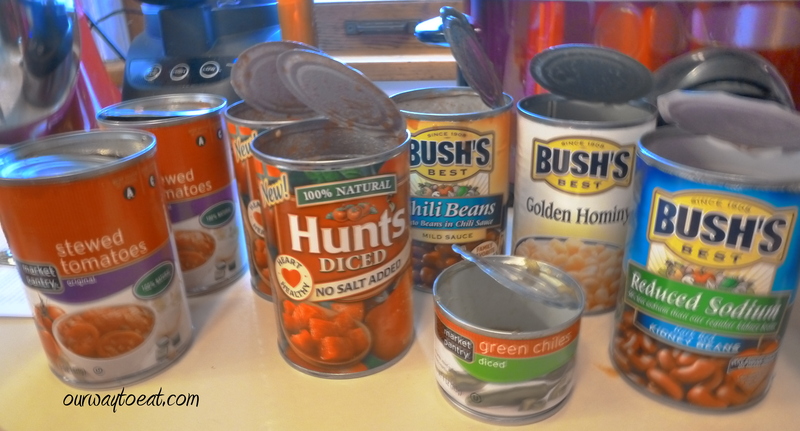 This soup works because once you bring the crock pot and the right cans into the kitchen, it practically makes itself. 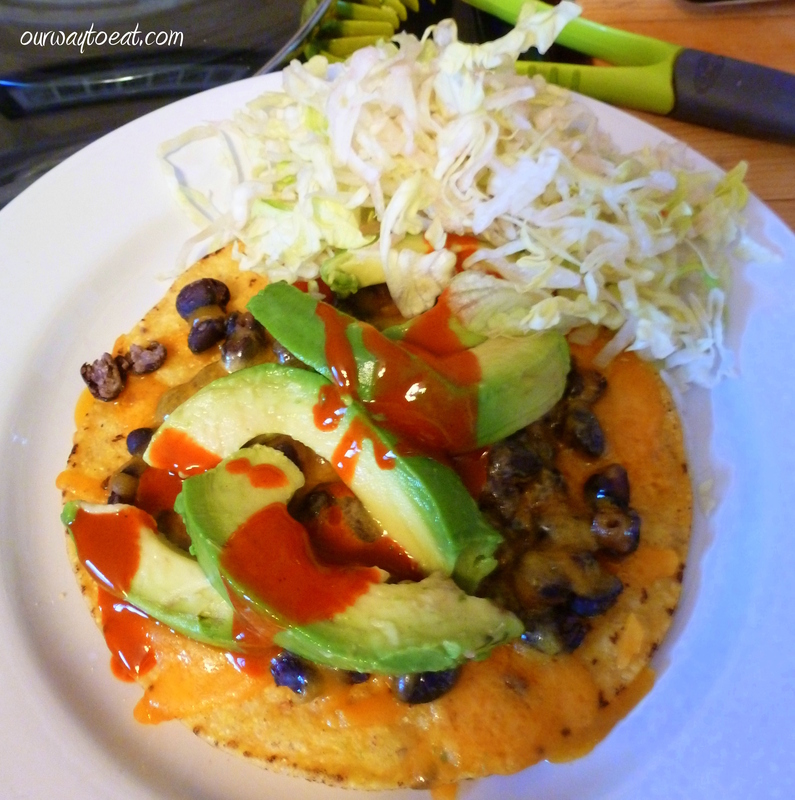 It is hearty, and the toppings add variety and make for a fun and casual meal. Taco Soup also reheats wonderfully, so we both had a delicious bowl today for lunch. If it sounds good to you, give it a whirl!